Some days I get so annoyed with our people – especially when we kvetch, we groan, we complain. Today, I was proud to stand in the sleet and freezing rain, alongside thousands of others at Castle Clinton in Battery Park, the very spot through which many of our parents and grandparents passed on their way to the American dream: a better life for themselves and their families. As the hail pelted us, we stood in solidarity with immigrants and refugees who seek that same American dream today. In the cold, we stood to oppose the administration’s efforts to extinguish Lady Liberty’s lamp by slamming shut our country’s golden door. Our people has a long memory and we remember all too well the fate of the passengers aboard the MS St. Louis, turned away from our shores during another dark time in our history. 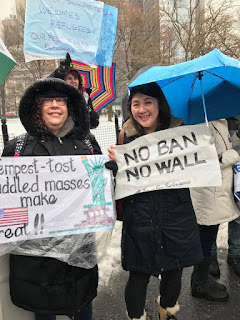 Soaked to the skin, we listened to words and music from elected officials, community and religious leaders, and recent immigrants – ever cognizant that once upon a time, we were refugees, too. Today we stood on the shoulders of those who came before us, unwavering in our commitment that “never again” means never again for anybody.